Candied Yams are a classic Thanksgiving side dish made from yams/garnet sweet potatoes and loaded with butter, sugar, honey, and spices. Candied Yams are a holiday meal staple, and this sweet and spice-filled recipe is a must-have for the table! Everyone should have a fail-proof Candied Yams Recipe on hand. With Thanksgiving just around the corner, this easy dish will definitely come in handy, and probably more than once! JUST TAKE ME TO THE CANDIED YAMS RECIPE ALREADY! 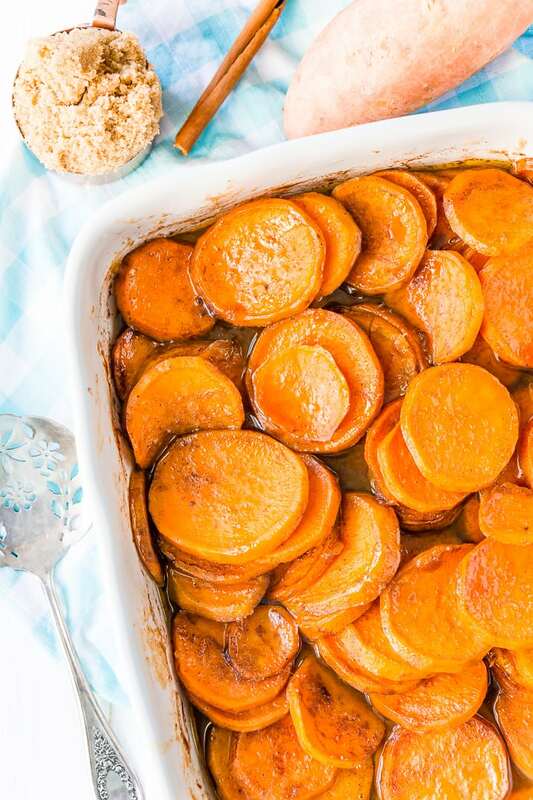 If you’d rather skip my (very helpful, I think) tips and tricks, essential cooking info, and similar recipe ideas – and get straight to this deliciously easy Best Ever CANDIED YAMS Recipe – simply scroll to the bottom of the page where you can find the printable recipe card. Something to note about this recipe is that you can use sweet potatoes in place of yams if you prefer. Both taste delicious, but there is a difference between the two. In the United States and Canada, what many of us use in the candied yams recipes that grace our holiday tables is a garnet sweet potato, the reddish-brown skinned tubers with a rich orange flesh. Sweet potatoes and yams are often mixed up or used interchangeably. Turns out, there’s not only a distinction between the two — but neither of them is even a potato! According to Epicurious, sweet potatoes and yams are part of two different plant families. Also, sweet potatoes are grown in the U.S. while true yams are found in Africa, Central America, or the Caribbean. They look a bit different, with yams being more oval in shape with a white flesh and sweet potatoes tapering at the ends have an orange flesh. 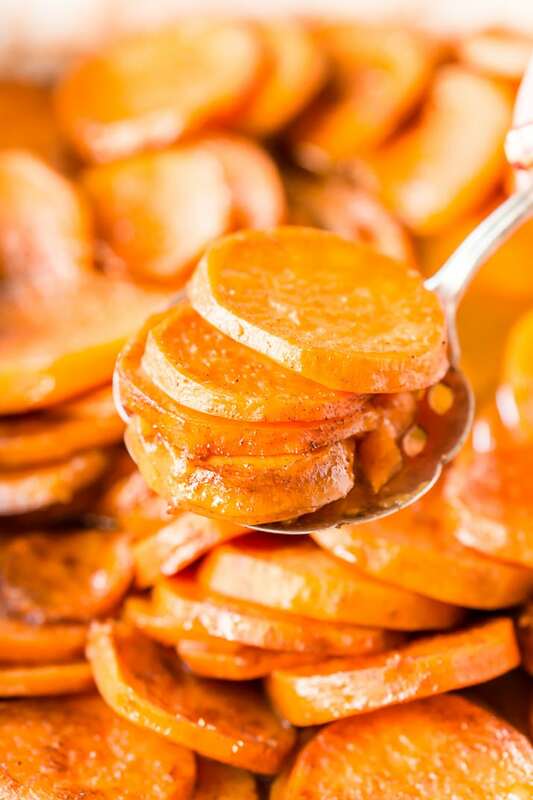 And as far as taste goes, yams have a starchier, drier texture than sweet potatoes. 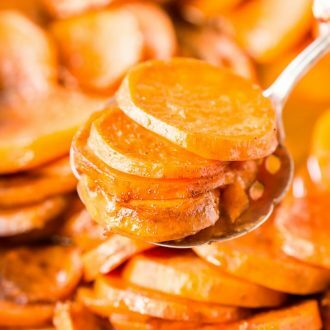 Luckily, for the purposes of this recipe, you can use either yams (if you can get your hands on the real thing) or garnet sweet potatoes, as mentioned above. Either way, you can’t go wrong with this delectable dish! For a truly balanced holiday feast, you need a mix of both sweet and savory dishes on the table. 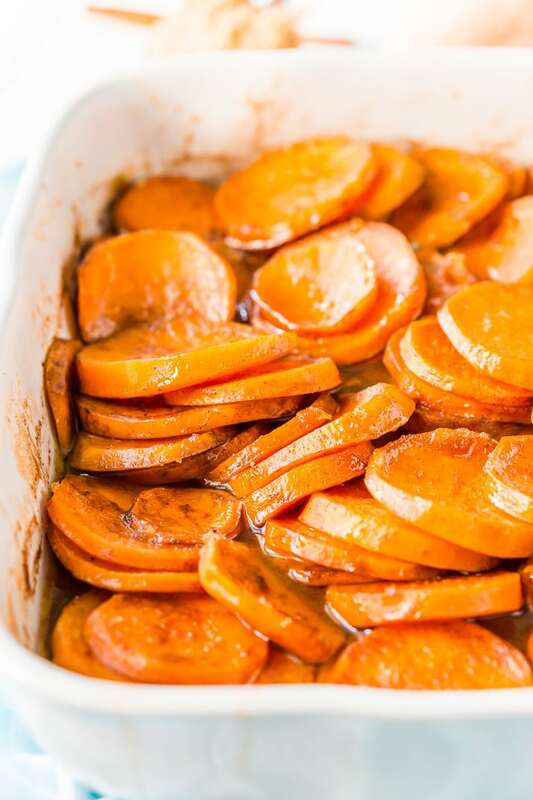 These Easy Candied Yams / Candied Sweet Potatoes definitely fall into “sweet side dish” category. Maybe that’s why my husband Matt refers to them as “The Sweet Tea of the Thanksgiving table.” I guess they do have a bit of Southern charm, don’t they? How Do You Make Candied Yams? Baked Candied Yams are easy to make with just a handful of ingredients and the end result is a sweet side dish that’s perfect for any holiday gathering. 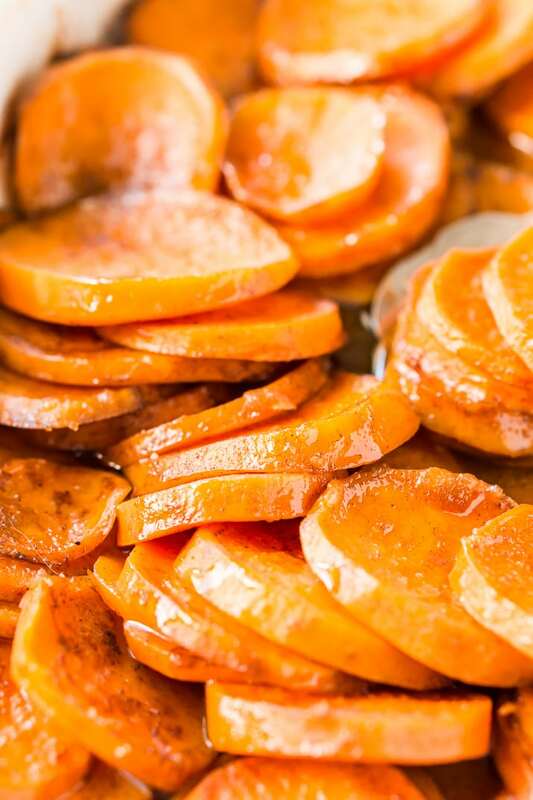 Begin by preheating your oven to 400 degrees F and peeling and slicing your sweet potatoes. Next, in a large bowl, mix together the melted butter, brown sugar, granulated sugar, honey, spices, and vanilla. Add in the yams/sweet potatoes. Use a mixing spoon to toss the sweet potato in the sugar mixture to coat. Transfer the potatoes and any additional sugar mixture to a 9×13-inch baking dish. Cover the baking dish with aluminum foil and bake for 30 minutes. Remove from the oven and peel back the foil and stir the potatoes. Place the foil back over the top of the pan and bake for an additional 15 to 20 minutes or until yams are fork-tender. Remove from the oven and allow them to sit for 100 to 15 minutes before serving. Some people love adding marshmallows to sweet potato dishes (I’m one of them!) and you can easily add them to this one too! Once the yams are done cooking, sprinkle mini marshmallows over the top of them and then put under the broiler for a couple of minutes until the marshmallows are golden brown. If you’re making this dish in advance and plan on reheating it just before dinnertime, don’t do the marshmallow step until just before serving for best texture and taste. Whether you’re hosting the big meal or you’re headed to someone else’s home, these travel easily and taste great leftover. Thanksgiving is just over a month away. 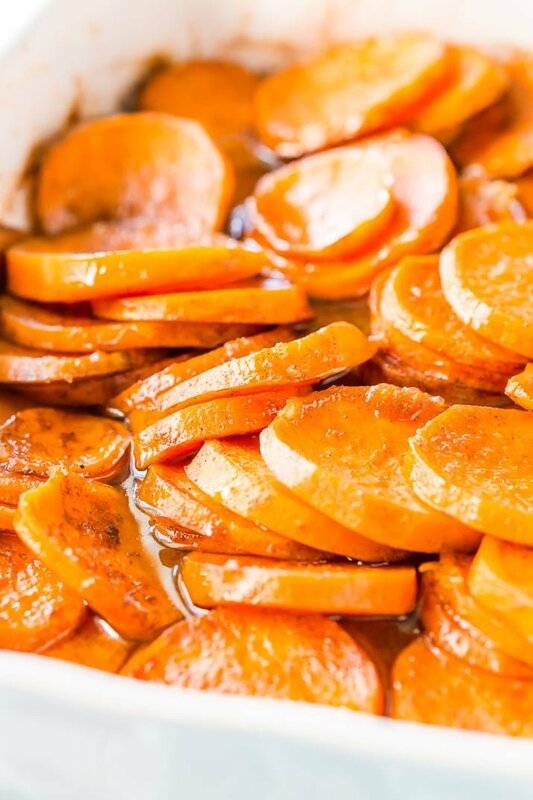 Make Candied Yams for your family, and everyone will be digging in for seconds! 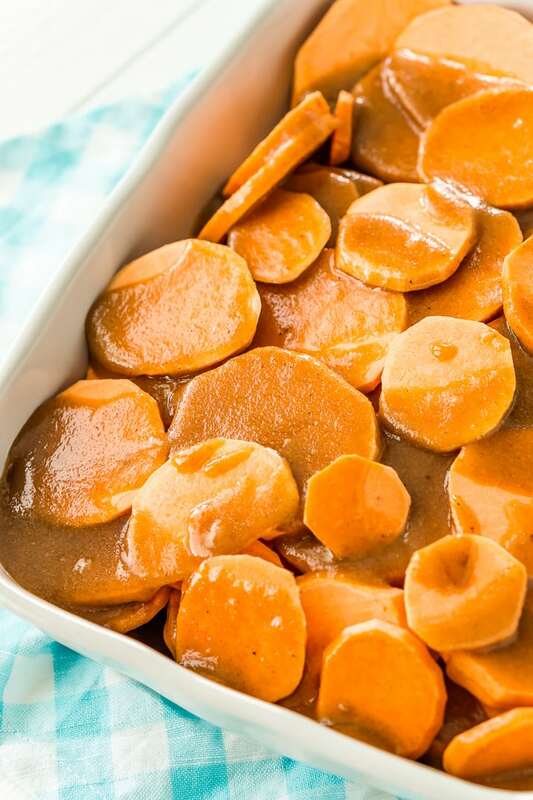 Pin this Candied Yams Recipe for Later! Peel and slice the yams/sweet potatoes into 1/2-inch rounds, making sure they are evenly sliced for even baking, and set aside. In a large bowl, mix together the melted butter, brown sugar, granulated sugar, honey, cinnamon, allspice, nutmeg, and vanilla. Add in the sliced yams/sweet potatoes and toss to coat. Transfer the potatoes and any additional sugar mixture into a 9x13-inch baking dish. With Marshmallows: Once the yams are done cooking, sprinkle mini marshmallows over the top of them and then put under the broiler for a couple of minutes until the marshmallows are golden brown. This is one of our favorite side dishes for fall. Can’t wait to try your version! A staple for our holiday dinners. Love how simple this comes together!